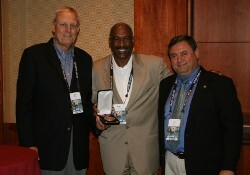 Ohio State University Associate Vice President and Director of Athletics Gene Smith (center) accepted the United States Sports Academy’s 2010 Carl Maddox Sports Management Award Thursday, June 16 at the National Association of Collegiate Directors of Athletics annual convention in Orlando. Dr. Gary Cunningham (left), an Academy Board of Trustees member and 2005 winner of the Maddox award, made the presentation with Academy Vice President Dr. T.J. Rosandich (right). For their longtime contributions and achievements in sports, the Unites States Sports Academy recently honored Ohio State Vice President and Athletic Director Gene Smith and Michael Cleary, the National Association of Collegiate Directors of Athletics executive director for 46 years, at the NACDA annual convention in Orlando. Smith accepted the Academy’s 2010 Carl Maddox Sports Management Award for successfully guiding one of the nation’s most comprehensive and successful college athletic programs since 2005. Also at the NACDA annual convention June 16, the Academy paid tribute to Cleary for building NACDA into one of the premier collegiate organizations during his long tenure there. Smith and Cleary were honored during a ceremony at the NACDA convention in front of a room full of a who’s who of current and former athletic directors, including many past recipients of Academy awards. Dr. Gary Cunningham, an Academy Board of Trustees member and 2005 winner of the Maddox award, made the award presentation to Smith. The Carl Maddox Sport Management Award, named in honor of the former Athletic Director of Louisiana State University and Mississippi State University, is given annually to an individual for his contributions to the growth and development of sport enterprise through effective management practices. The individual should exhibit mastery of all the management functions, be well known in the sport arena, and have an abiding belief in the need for ethical behavior in sport management. Michael Cleary (center), who is stepping down as National Association of Collegiate Directors of Athletics after 46 years, was honored by the United States Sports Academy on Thursday, June 16 at the NACDA annual convention in Orlando. 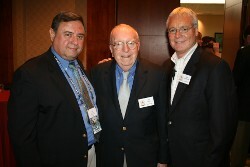 Pictured with Cleary are Bob Vecchione (right), the new NACDA executive director, and Academy Vice President T.J. Rosandich (left). At Ohio State, Smith oversees 36 fully-funded varsity sports and more than 1,000 student-athletes. The department of athletics is completely self-supporting and receives no university funds, tax dollars or student fees. In fiscal year 2009-10, the department transferred nearly $30 million in assessments to the university, including more than $13 million in grant-in-aid reimbursement. In Smith’s first three years at Ohio State, the department of athletics finished in the black financially and increased its reserve fund. As a former college athlete and coach, Smith is passionate about the well-being of student-athletes. Smith is the eighth person and first African-American to hold the athletics director position at Ohio State. During the past 25 years, he has also served as athletic director at Arizona State, Iowa State and Eastern Michigan universities. Meanwhile, Academy President and CEO Dr. Thomas P. Rosandich credited Cleary for being “the genesis” for the founding of the Academy in 1968. The Academy’s first Board of Visitors consisted of 33 members and all but one were Directors of Athletics. Two of those original members went on to become chairman of the Academy’s Board of Trustees. Cleary will continue to serve as NACDA director emeritus for the next three years. Bob Vecchione is taking over for Cleary, who received an Honorary Doctorate in 2003 from the Academy. “I’ve had great presidents who have given our association the leadership we have needed to reach the height that we have attained,” Cleary said. Cleary, who was named the organization’s executive director in 1965, has overseen the creation of NACDA’s Convention, its 11 affiliate associations, Facilities Workshop, Security Summit, the NACDA Daily Review, the Learfield Sports Directors’ Cup and Athletics Administration. As president of the John McLendon Minority Scholarship Foundation, Cleary has been responsible for raising more than $2 million to date. NACDA is the professional and educational association for more than 6,500 college athletics administrators at more than 1,600 institutions throughout the United States, Canada and Mexico.